You can do anything for 15 days. Fifteen days will pass one way or another, how do you want to feel at the end of 15 days? I recently completed a Whole30, but found myself slipping into a my old ways. I also have leadership conference coming up for my oil business and I knew I wanted to get back on track and leave for leadership feeling my best. 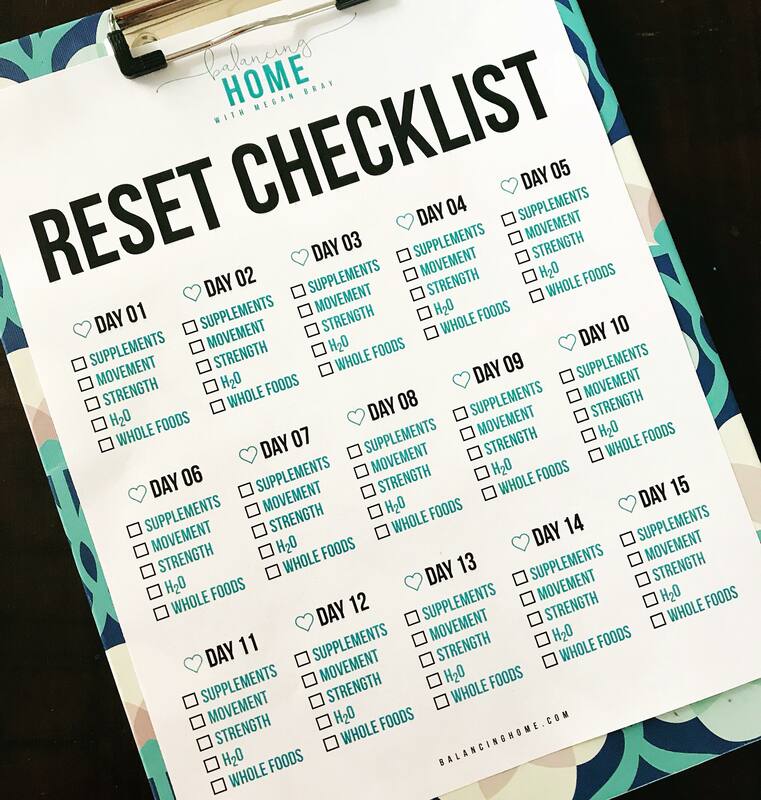 The best way to get back on track is with a reset. No beating yourself up or guilt. Just wake up with the intention of setting a few good habits. I also roped the husband in for a 15 day reset and it has been so nice to have a partner in crime. Find an accountability buddy!! I will go over all the details of the reset and point you in the direction of my favorite resources, but at its core- it is simple and you are welcome to make it your own! I want to start by saying I’m posting tons of updates on my 15 day reset on My instagram stories, so be sure to stop by and check them out. When you join, share and tag me on social media so I can cheer you on! For me, this looks like Whole30 eating, which I’ve written about here and here. The basics: No sugar, alcohol, legumes, dairy, grains, soy. You have to figure out what your best and healthiest eating looks like. I enjoy this for a few reasons. I am not obsessively measuring, weighing or thinking about food. It really does slay your sugar dragon and reduce cravings. I listen to my body and focus on eating whole and nutritious food. Whatever that looks like for you, do that. This is a huge adjustment for my husband and I and yet, it is like the simplest thing to do for your well-being. And yes, you will run to the bathroom constantly. Take your weight divided by 2. Whatever that number is, that is how many ounces of water you should drink. So if you weigh 160, you are looking to drink 80 oz of water a day. I love this cup (it holds 24 oz which makes tracking water super easy) or this water bottle for hitting my hydration goals. Keep it simple. Simple is sustainable. Choose a HIIT workout, bust out some pushups, grab some dumbbells, squat while you brush your teeth. You get the point. For me, due to my rectus diastasis, I will be doing MUTU. You can learn more about MUTU here. My challenge is really about closing my rings on my Apple Watch. I have this one and I freaking love it. Move (red)- Which is really about burning a set number of calories via movement. For me, that ends up being just over 10,000 steps. If you don’t have an Apple Watch, trying to hit 10,000 steps is a great goal. Exercise (green)- Which is based on having your heart rate at a certain level for 30 minutes. A brisk 30 walk does that for me. Stand (blue)- Which means that for at least one minute, every hour, you get up and move for one minute. Great for some Netflix binge awareness ;)! The goal is be mindful of your movement. It isn’t about sitting all day and then killing yourself for 30 minutes at the gym. So aim for 10,000 steps and 30 minutes of brisk walking (or whatever your exercise jam is). If you aren’t an exerciser, please don’t punish yourself or turn this into something it isn’t. Don’t start training for a 5k or create some bootcamp regimen you are going to hate by day two. For me, supplements is the Lifelong Vitality Pack from DoTERRA. The husband is hooked on them too. They have been such a game changer for us. I wasn’t a supplement taker before, but I can definitely tell the difference when I forget to take them. The simple decision to take these supplements every day is one way that I care for myself. Are you remembering to take care of YOU? If you don’t have supplements or a vitamin you are committed to, but would love to look, feel and live younger, longer- I highly recommend these. (30 day money back guarantee too). In this house, we supplement our health with oils and lots of wellness products from DoTERRA. Chances are, if you are considering a 15 day reset, you are the kind of person who is ready to embrace some wellness in your life. The smartest way to start your wellness journey with DoTERRA is by getting your own wholesale account! You will have the option of earning FREE product credit and FREE product of the month. You will create a wellness transformation in your life with an awesome and supportive community. You will feel confident and empowered in your home (especially as a momma). You will feel less stress, increased energy, better sleep and so much more by incorporating these wellness products into your life. You will have access to my favorite roller bottle blend, online courses and lots of resources as you take part in this positive change for you and your family. You receive your wholesale account (shop 25% below retail) for FREE. Oils are bundled in a smart way, based on your health goals and best sellers. You will immediately have on hand natural solutions to create the lifestyle you are craving. Interested in a promo? You can always check with me before ordering to see what is available. Click the green “JOIN & SAVE” button in the lower right hand corner. Choose you country and language. Congrats on making a great choice. Now keep an eye on your inbox for more info on team resources! I was just going to start this with take your vitamins, here is what I take. The thing is, these vitamins and wellness products have been life-changing for me and my family so I figured I should share what I know and give you a chance to get in on the awesomeness. Check off each of the five things as you go and then color in your heart when you are done. Color in 15 hearts and CONGRATS!! You have officially created lifelong habits that will serve you well. I’m so excited to have you join me! Whose in?